Based on recent quantum mechanical calculations, it is now believed that the staggered conformation possesses a favorable interaction between an occupied, bonding MO and an unoccupied, antibonding MO. This interaction lowers the energy of the staggered conformation. This favorable interaction is only present in the staggered conformation. 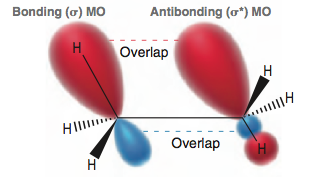 When the C—C bond is rotated (going from a staggered to an eclipsed conformation), the favorable overlap above is temporarily disrupted, causing an increase in energy. I've searched online and most sources provide a similar explanation and diagram. My issue is mainly with the diagram: why are the MOs illustrated as though they span only the C—H bonds? I thought that MOs were supposed to span the entire molecule, rather than being localized along/parallel to the internuclear axes of two nuclei. Are these MOs correct? Do MOs cover the entire molecule or do they each exist between two bonding atoms? The unfortunate answer is: both, and it is rather complicated. It can be noted at this point, however, that between two atoms connected by covalent (or even ionic bond) there are MOs. (spin) MO: a one-electron wave-function. Contains one electron, can be combined to with another spin MO to form what we usually think of as an MO, that is, doubly occupied. Wave Function (WF): Typically a product of MOs, at least in the simpler approaches (Hartree-Fock [HF], common Density Functional Theory). The product is anti-symmetrized such that it obeys the Pauli principle. These products of MOs can be linearly combined to yield more accurate, complicated and expensive approaches. Density: The expectation value of a WF when applying the density operator. Out of the three, this is the only true observable, for instance by X-ray diffraction. If you have a open shell molecule, you may be able to observe a spin-density, for instance by Electron Spin Resonance spectroscopy. What's the point of these definitions? They illustrate that a MO and the observable density have a few steps in between. Let's assume that someone gives us a set of MOs which yield the correct density of a molecule (as well as other correct observables). This is already a tall order, by the way. It is a mathematical fact that one can "rotate" the MOs, that is, create new MOs from linear combinations of old ones and still yield the correct density. So the set of "correct" MOs is not unique by the reasonable measure that it should give us the correct density. OK, so there is more than one set of "correct" MOs. So what? canonical MOs: these are eigenfunctions of the Fock operator, which is central to HF, but also of relevance for post-HF methods. They also preserve meaningful orbital energies (which relate to ionization potentials), but they are usually completely delocalized over the whole molecule. localized MOs: "rotations" of the MOs have been performed to yield orbitals of (hopefully) minimal spatial extent. They are more easily interpreted, but the mathematics involved is iterative, meaning that minor changes in molecular geometry could lead to rather different local MOs. There is also more than one scheme to do this, and the results can be fairly different. natural MOs: suppose you have performed the very accurate/very expensive calculation of full Configuration Interaction (full CI) for your molecule. The resulting orbitals are then eigenfunctions of the true Hamiltonian (in the given basis set). You will probably never encounter these due to the sheer cost of the calculation - and they may not look all that different from canonical orbitals. They do not enter the density (duh), but are often relevant to discussions of mechanisms, such as initial point of attack or stabilization. In my opinion, there is basically no way to pick a good scheme for them - canonical orbitals sort-of yield electron affinities. Then all hope is lost. There's no way to choose. Well, for occupied orbitals, there kinda is. One should compare orbitals (of one computational level) with each other across molecules to get to useful results. The textbooks usually do not give you this opportunity because you have no idea where those orbitals come from. Back to OP's question: yes, canonical orbitals would extend over basically the whole molecule. You are being shown, in all likelyhood, orbitals that have been localized somehow. They are used as illustrations by the authors and that's usually not a bad idea. Take 'em with a grain of salt. In addition to TAR86's good explanation I add an example to visualise the different molecular orbitals. A few general remarks up front though. Quite a few textbooks (especially in organic chemistry) use the term quantum mechanical calculations (or variations thereof) in a (somewhat) sloppy fashion. They offer (generalised) phenomenological explanations based on such calculations. This is in principle good, as we are moving away from a purely Lewis-structure based understanding of bonding and man-made concepts as ring/ torsional/ angle strain, &pm;I/M, resonance, etc. (the list is almost infinite) towards a more generalised, complete, overarching understanding, but it can also lead to ambiguity. Sometimes (read: often) books forget to mention the limitations of such explanations and the justification of such models is left as an exercise of critical thinking to the reader. 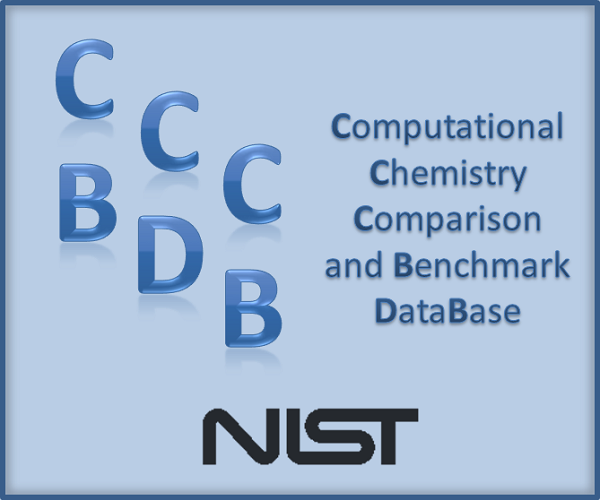 As the average chemist progresses from basic to advanced understanding of bonding it can get confusing since some books use similar terms for different things. One of the common things is arguing with localised orbital schemes, predefined hybrid orbitals and the likes, which allow little to no flexibility. While these arguments are also deeply rooted in theoretical chemistry, i.e. Valence Bond theory, the source of the computation is most times in terms of Molecular Orbital theory. Rather than performing the extensive (and quantitative) calculations applying the former, the more common Molecular Orbital approaches (Linear combination of atomic orbitals to form molecular orbitals; or LCAO=MO) are used, such as Hartree-Fock, post-HF and Density Functional Approximations. The latter are so well developed that it won't be long that we can run simple calculations on the fly on our phones (The future is here ...). When you start learning quantum chemical calculations you might be confused at first, because a lot of such tempting model explanations don't seem to fit any more. Orbitals. First and probably most important is to realise that the shapes we recognise as orbital depictions are not real in any sense. These are visualisations of mathematical functions at a certain cut-off value. This is necessary as a wave function (in principle) only vanishes at infinity. In this sense, orbitals obviously always span the entire molecule. But this is in general not the reason why we say molecular orbitals span the entire molecule; this is a general feature of Molecular Orbital theory (as opposed to Valence Bond theory). Molecular Orbitals Interpretation. I have used DF-BP86/def2-SVP to run a quick geometry optimisation of staggered ethane with Gaussian09. The approach to obtain molecular orbitals on this level of theory is similar to Hartree-Fock as in that it uses one Slater-Determinant (not a product of wave functions!) as the trial function only. The general feature of this approach is that all atomic orbitals contribute in some fashion to the set of molecular orbitals. The coefficients to the atomic orbitals are optimised in a way that the expectation value of the energy of the trial function is minimal. Therefore in many cases they look like the following picture. 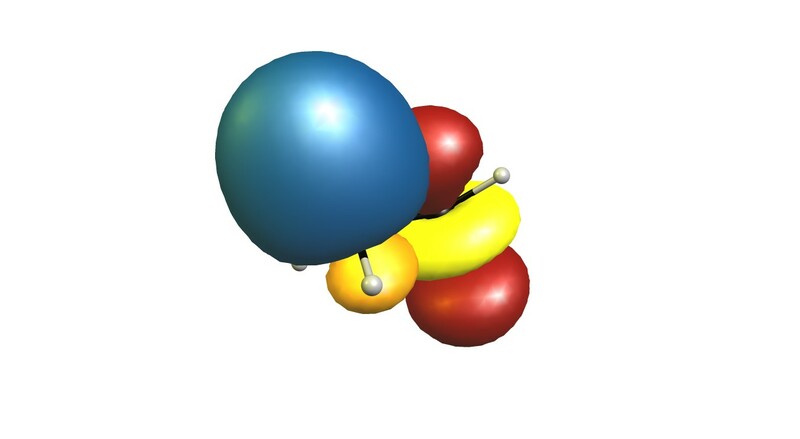 In the graphic above, the orange/blue orbitals are occupied and the red/yellow ones are virtual; core orbitals omitted. Because of symmetry we have some degenerate orbitals in the mix. Strictly speaking only the occupied orbitals are actual solutions to the pseudo-Eigenvalue problem, but we can use these to generate virtual (high energy) solutions, too. While these orbitals offer a general understanding, and often reproduce ionisation potentials and electron affinities, it is difficult to interpret them with the conventional understanding (of Lewis structures) that the organic chemists love so much. 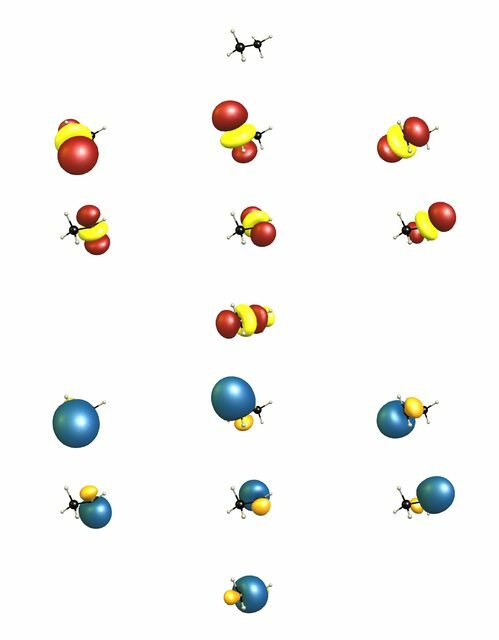 Localised Orbitals and the Valence Bond Interpretation. There are numerous localisation schemes for canonical orbitals out there. Different approaches use different criteria. A common approach is to use linear combinations of the canonical orbitals to produce a different set of molecular orbitals with a compacter spatial extend, more of the electron density is contained in a smaller volume. The general aim is to produce orbitals which represent bonds where we expect them. Through this approach we loose some of the properties, especially those which are energy related. The above picture could be calculated quantitatively with a valence bond orbital approach, which uses hybrid orbitals and molecular conformations as an input. This usually needs considerably more calculation time as it is in theory already more extensive and more expansive. However, qualitatively it would probably reproduce the above picture (just more accurately), and often offers only for extraordinary bonding situations considerably more insight. As such, MO theory is complementary to VB theory; at their respective complete treatments they are equal. Not the answer you're looking for? Browse other questions tagged organic-chemistry molecular-orbital-theory or ask your own question. Why is the benzyne triple bond distorted? How to determine bond order for special cases? Why is there a factor of half in the definition of bond order? Should there be a difference in the absolute energy gaps between bonding and antibonding MOs from the energy level of the AOs in the H2 molecule? What is the valence molecular orbital of the ions of a fluorine molecule?